We are enjoying our summer here at The Mill House! Each year we evaluate all we do , including our advertising, our web presence, our reservation system, and what we can do to better take care of our guests. We’ve made just a few changes this summer. The fun changes are the ones I get to make when it comes to decorating, baking, serving, and cleaning. I knew I was getting close to needing a new set of dishes for the inn. Well, I was able to hurry the process when I tipped a large tray of dishes and they went crashing down onto the brick patio. 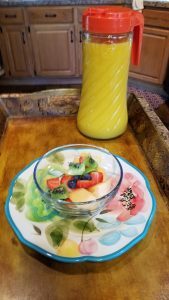 I had my eye on the “Pioneer Woman” dishes from Wal Mart. I just love the colors and the designs. The best part is they sell many additional pieces that I can buy a little at a time and I can replace a single plate or bowl if I break it. I also just love the style and design. It matches perfectly with the inn and my personality. Laid back, comfortable, and homey! I’ve never been a Victorian type girl and that’s why I love The Mill House. Another change to our web site is our new reservation system. Not only does it help save us a lot of time, it is much easier for our guests to reserve a room online. It brings up just the available rooms for the dates you select, is mobile friendly and also gives our guests a chance to choose from one of our special packages. We have a package to celebrate your special occasion. You can also purchase my scones, a Mill House Mug, or a Mill House T Shirt. 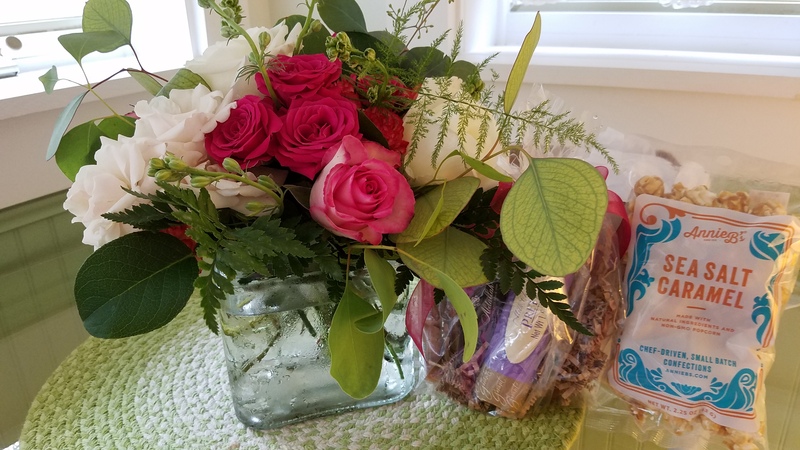 Below is a picture of our Special Occasion Package which includes a beautiful arrangement from 3rd street blooms in Waterville, Ohio and gourmet candies that they packaged for us. The biggest change is in our Ruth Thomas Room. It used to accommodate 3 with a twin bed and a queen bed. We decided that we would take the twin bed out of the room and replace it with a love seat. 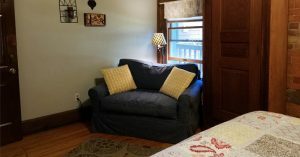 It makes a cozy seating area for our guests to read or take in a movie on the TV. Each of our rooms will accommodate two guests. It helps make it easier for us to control the amount of guests we have for breakfast and as a total in the inn. The best part is everything else is the same. The warm welcome as our guests arrive, a clean and cozy place to stay and enjoy our town and the river, a great big full breakfast made with love, lots of great shops and restaurants within walking distance, and a place to just relax and forget about all the stuff going on at home! We love our guests, even those we root for the wrong teams!! Can’t you tell by the big smiles that they can put their alliances aside and enjoy each other’s company! Still lots to do in town this August! The Sunset Jazz and Art Festival is Sunday, August 19th and we still have a room available. Check out our new reservation system on our website and find the perfect date and room for your stay! 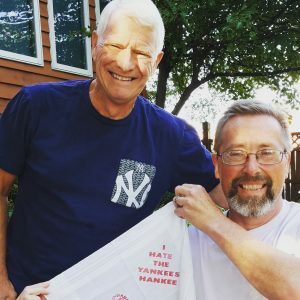 Even if you are a Yankee fan!! You Rock the changes…and You Rock on everything that stays the same! More power to your continued ministry!